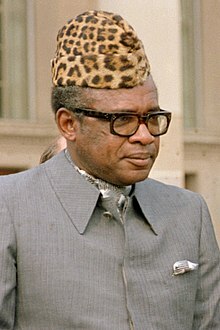 Mobutu Sese Seko Kuku Ngbendu wa Za Banga (born Joseph-Desiré Mobutu; 14 October 1930 – 7 September 1997) (/məˈbuːtuː ˈsɛseɪ ˈsɛkoʊ/) was the President of the Democratic Republic of the Congo. The country was known as Zaire for much of his rule. Mobutu is commonly known as Mobutu or Mobutu Sese Seko. While in office, he formed an authoritarian regime, amassed vast personal wealth, and attempted to purge the country of all colonial cultural influence. He was an anti-communist. During the Congo Crisis, Mobutu led a coup against the nationalist government of Patrice Lumumba. He wanted to take control of the government of Congo-Léopoldville. He soon became the army chief of staff. In 1965 he led a second coup to be Prime Minister. Then in 1967 he established a presidential form of government headed by himself. As part of his program of “national authenticity,” Mobutu changed the Congo's name to Zaïre in 1971. He changed his own name to Mobutu Sese Seko in 1972. Mobutu established a one-party state and a cult of personality. During his reign, Mobutu built a highly centralized state. He amassed a large personal fortune through economic exploitation and corruption. Because of this some people called his rule “kleptocracy.” The nation suffered from uncontrolled inflation, a large debt, and massive currency devaluations. By 1991 economic deterioration and unrest led him to agree to share power with opposition leaders. He used the army to stop this change. In May 1997 rebel forces, led by Laurent Kabila, removed him from the country. Mobutu Sese Seko is notorious for the corruption, nepotism, and embezzlement of billions of dollars that took place during his reign. He also had extravagances such as Concorde-flown shopping trips to Paris. Mobutu presided over the country for some four decades, despite many reports of abuses and human-rights violations. As such, many have described him as the "archetypal African dictator". Mobutu died in 1997 of prostate cancer in Morocco.